Once again the wonderful Zorra has coordinated a celebration of the World Bread Day, asking bloggers from all over the globe to bake, buy, or photograph bread and blog about it today. World Bread Day is an event created by the UIB (International Union of Bakers and Bakers-Confectioners) in an effort to provide an opportunity to talk about bread and bakers, to find out about their history, their importance, as well as their future. This was my first experience working with fresh yeast and I held my breath throughout the entire process. Of course I knew that fresh yeast could work – that’s all I have ever seen my grandma use – but I have also heard that it tends to be a bit more temperamental than dry yeast so I was a little nervous. And as the saying goes, there is nothing to fear but fear itself. I think it’s pretty evident that my dough rose! Absolutely no problems whatsoever to report with using the fresh yeast; as you’ll see from the recipe below, all of the ingredients were combined together at one time (no proofing of the yeast). Not only was I thrilled about such a fabulous loaf of bread, but I was also excited about the opportunity to cross another conquest off of My 100 list. I’m enjoying the adventure of taking on all of these unique challenges. 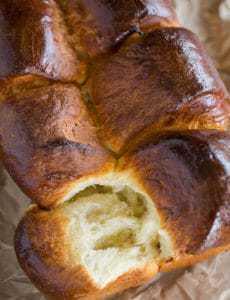 This challah was so flavorful – the crumb has such a rich, sweet and moist texture and when you pair that with a hearty crust enriched with an egg wash, you get something really incredible. I can’t wait to use this for some rockin’ French toast on Saturday morning! I know I’m raving about a recipe that calls for a whopping 8 egg yolks. And I also know many people will be turned off by the seemingly large amount of waste that this produces. But you don’t have to waste anything – separate the eggs and put the whites in an airtight container and store in the fridge for up to 5 days. Make an angel food cake! Or just scramble some egg whites for breakfast. See? No waste! A big thank you to my friend Kayte who got me the Martha Stewart Baking Handbook for my birthday this past year. It’s an awesome book and I can’t wait to dig even further into it! In the bowl of an electric mixer fitted with the dough hook, combine the flour, yeast, sugar, honey, salt, vegetable oil, egg yolks, and 1 cup water. Mix on low speed until the dough is smooth and stiff with a slight sheen, 8 to 10 minutes. Turn the dough onto a lightly floured work surface, and knead to make sure any loose bits are incorporated. Fold in the following manner: Fold the bottom third of the dough up, the top third down, and the right and left sides over, tapping the dough and flip it over, seam side down. Place the dough in a lightly oiled bowl, cover with oiled plastic wrap, and let rise in a warm place until doubled in bulk, about 1 hour. Brush an unrimmed baking sheet with vegetable oil or line with parchment paper. Set aside. Return the dough to a lightly floured work surface, and divide into three equal pieces. Roll each piece into an 18-inch log, and place the logs parallel to one another; pinch the ends together at the top. Weave the three strands into a tight braid, tugging gently as you go. Press the ends together to seal. Place loaf on the prepared sheet. Loosely cover with oiled plastic wrap, and let rise until doubled in bulk, about 1 hour. Meanwhile, preheat the oven to 375°F. Lightly beat the remaining whole egg and brush gently but thoroughly over loaf, making sure to cover any seams and crevices. Bake until the crust is dark brown, 50 to 60 minutes. The bread should reach an internal temperature of 190°F on an instant-read thermometer, and should have a hollow sound when tapped on the bottom. Transfer the bread to a wire rack to cool completely before slicing. Bread can be wrapped in plastic and kept at room temperature for up to 3 days. I haven’t been able to find fresh yeast but I have the rapid rise yeast that’s refrigerated and the active dry yeast. Should I use the active dry yeast as you instructed it above? Hi Rachel, Yes, that should work just fine! I just recently discovered this blog and I am already enjoying it! It was interesting to read about your Challah baking experience. Although I have yet to try my hand at making this scrumptious and traditional bread, my mom and grandma have been baking Challah for as long as I can remember . Your loaf looks gorgeous. There are a few styles/techniques used to braid Challah but one of the most common ones is using a six braid method. I remembering learning to do a six braid as a young girl from my grandmother. Once you get the hang of it it is quite fun and produces a really pretty loaf. Just made this…magnificent! The only thing I changed was allowing the final rise overnight in the refrigerator and allowing it to come back to room temp before brushing with egg and baking. This makes a HUGE loaf, so next time I will probably shape into 2 smaller loaves. We haven’t tasted it yet, but the smell is outrageous. My other recipe is from Joan Nathan. 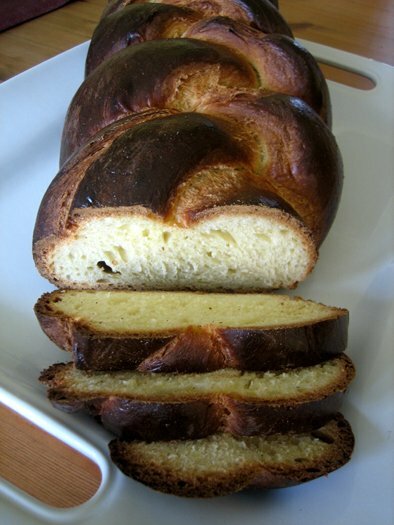 It uses active dry yeast, double the flour(all purpose), and 4 whole eggs. That too, is a great recipe, but this definitely smells more authentic…I am 52 and Jewish, I have been eating challah my entire life. I am seriously standing guard while waiting for this to cool because my family is threatening to cut into it!!! By the way, this is my first time baking with fresh yeast, which I found in the dairy case at Whole Foods. Thanks for the recipe…great website! In Denmark we almost only use fresh yeast. A small tip is to pour a small tablespoon of sugar over the yeast in your mixing bowl and wait for 5 minutes, then the yeast will become quite fluid so it is easy to mix it with the other ingredients. Also remember that if you ad any liquid when using fresh yeast it should be lukewarm, 30-35 celcius if it gets warmer than that then the yeast is killed and your dough will not rise. 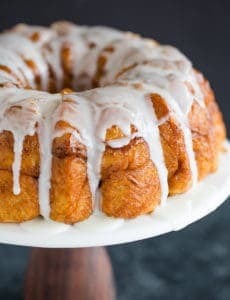 I have made this recipe before, I would like to make it again for Thanksgiving, but It seems to be missing from the original post. Am i missing something? Hi Diana, My apologies, there was a glitch when we moved to the new site, but the recipe is back up there now. Enjoy! I have always wanted to make challah and I’m really excited but I have a problem. I can’t find fresh yeast anywhere and I looked up Fleischmann’s website and it says the active dry yeast is equivalent but do I need to do anything with it before I add it? It’s still unclear to me. Hi Anna, Usually active dry yeast needs to be activated in warm water before it is added to the other ingredients. For the recipe above, follow it the same way, just make sure you have warm water, add the yeast first, wait about 5 minutes, and then add the other ingredients and proceed. Okay, thanks, Michelle! It’s just crazy how it’s not well explained. I wish I could make bread like you can. Looks great, and a perfect pick for World Bread Day! I am really looking forward to trying challah myself. Oooooh, my fav! Looks wonderful! 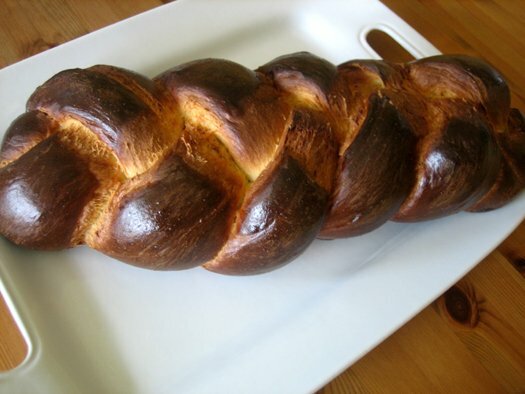 Your Challah is gorgeous and a lovely choice for World Bread Day! 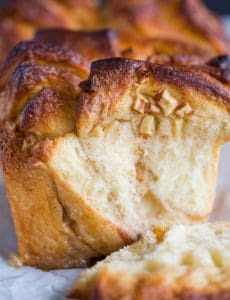 I would love to make this, it’s great for bread puddings as well. What a beautiful loaf of bread! It looks delicious. Looks great. I’ve only worked with fresh yeast once but always go for the granules… It just doesn’t stay active for long. And so fitting for international bread day because the two challahs you learned about? One is for your family, and the other is supposed to be donated to the poor of the community. Which is why true challah recipes always yield 2 loaves.